If you like a simple-to-knit scarf that has a flirty little feel, this pattern is for you. And, once you get the hang of it, it’s practically mindless. I used Debbie Bliss Donegal Luxury Tweed Aran and size 8 knitting needles. Since gauge on this scarf is no big deal, I think you could use any yarn and the suggested needle size that is recommended for that yarn. Row 1: Knit 4 stitches. Row 2: Turn work and knit 4 back. Row 3: Knit 6 stitches. Row 4: Turn work and knit 6 back. Row 5: Knit 8 stitches. Row 6: Turn work and knit 8 back. Row 7: Knit 30 stitches across. Row 8: Knit 30 stitches across. Repeat this pattern, rows 1 – 8, until desired length. Using 30 stitches with this yarn, the width of my scarf is 7 1/2 inches. 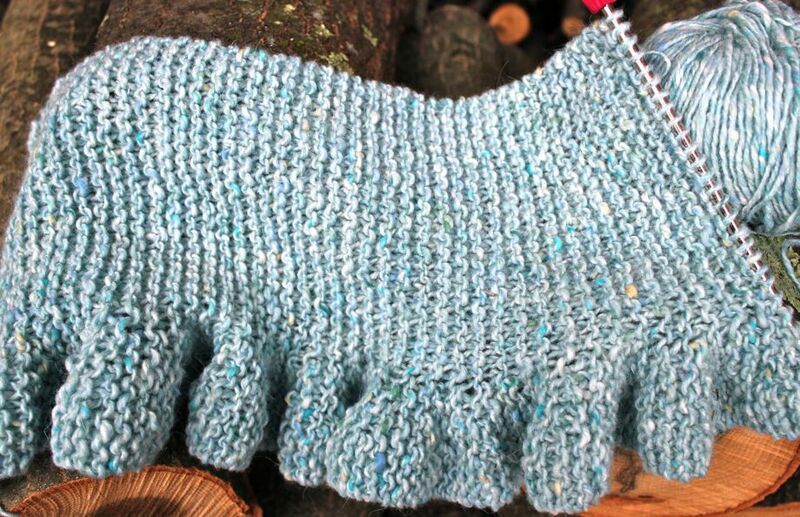 To make a narrower or wider scarf, adjust the number of cast-on stitches. Just be sure to follow rows 1 – 6 for the ruffle effect. It’s getting colder, and I know I’ll need a nice warm scarf, so I better get knitting. Time to cozy-up with a good movie, a cup of hot chocolate and a big plate of leftover Christmas cookies. Wishes for a warm and wonderful New Year! Very pretty! Makes me wish I knew how to knit. Would you please let us know how long the scarf was and how much yarn you used. The finished scarf was approximately 56″ long, which was enough to drape around my neck twice. I cannot remember the exact yardage, but I believe I used 3 – 4 balls of the Debbie Bliss Donegal Luxury Tweed Aran, at 96 yards per ball. Hope this helps!